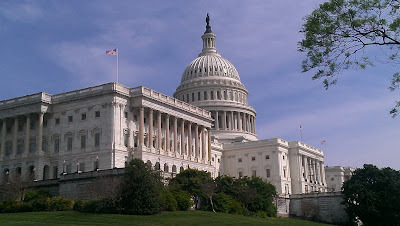 It was nice to have a day off from site seeing Sunday, but now we've only got 2 days left to see a few more things so on Monday, after paying for our last two days here, we headed back into the National Mall around 12:20. We had hoped to get a free 3 hour parking spot on the National Mall, and were very optimistic since it was still raining. We were hoping the rain would tamp down the number of people visiting the Mall and its attractions, and we were right! We found a parking place directly across from the National Museum of American History! It was just a few minutes before 1 pm so that was perfect......we wanted to be on our way out of downtown by 4 to avoid the worst of the traffic. Right behind me is the NMAH! We had only seen part of Level 3 on our last visit, but as it turned out the other exhibits on that level are closed for updating, etc., so we headed back downstairs (Level 2 - the entrance level) and went through the Emancipation Proclamation section with essentially chronicles the history of slavery in our country, the Abolitionist movement leading up to the Civil War, the Civil Rights movement, the March on Washington on the 100 year anniversary of the 13th amendment, and finally up to the modern day. One could spend hours in this exhibit and still not absorb all that is there. Having grown up in the 50's and 60's I well remember the newspapers and TV news programs reporting on Civil Rights marches, murders, school desegregation, etc. It does not seem that long ago, but in fact it has been 50+ years. 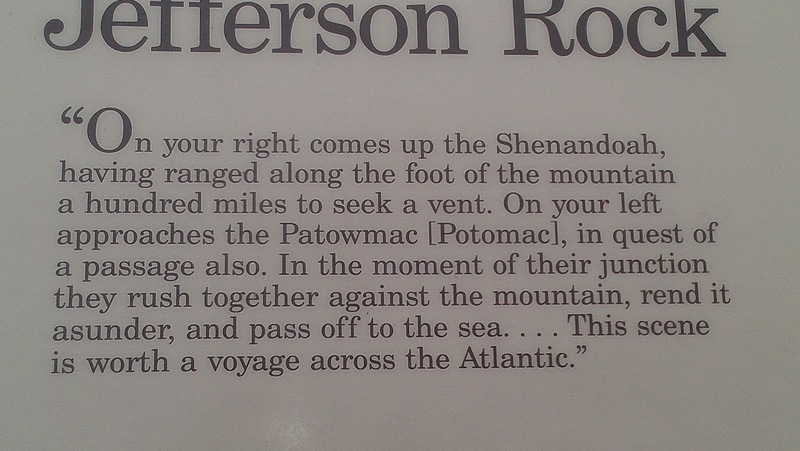 From there we went over to the exhibit on the "Star Spangled Banner" made famous by Francis Scott Key's words set to an old English drinking song. 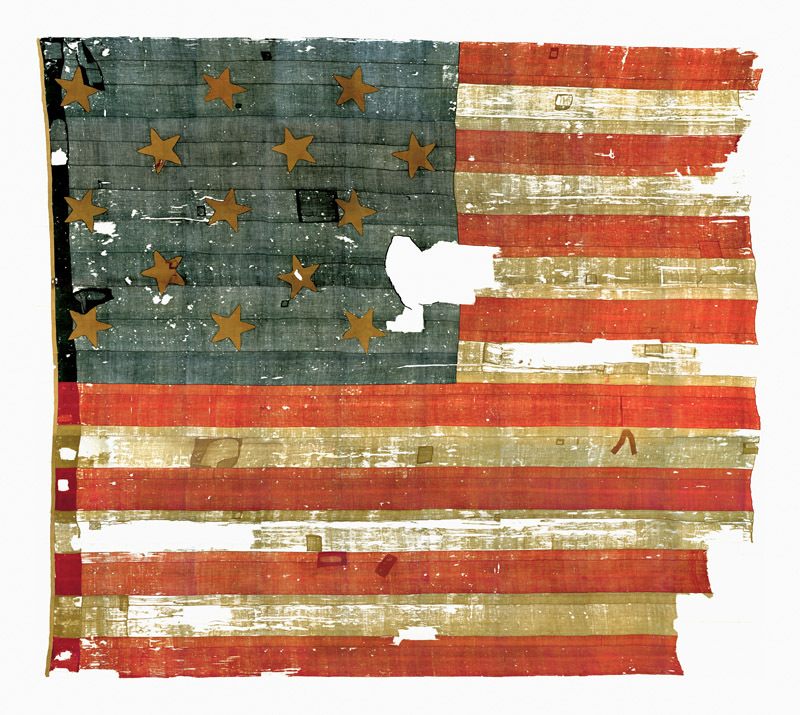 As you recall from history class the flag was made by Mary Pickersgill in 1813 during the War of 1812. In its original form it was 30' by 42'......quite enormous. This flag was one of two made by her and it was flying over Ft. McHenry in 1814 when the fort came under bombardment by the British Navy. Of course, we know from the words of Scott's song that after an all night barrage by the British the flag was "still there" the next morning. The pictures below shows how it looks today some 200 years later. There is no photography, or videography allowed anywhere in this display, so this picture is from the Smithsonian website. The flag was given to Lieutenant Colonel George Amistead who was in command of the fort that fateful night. It remained in his family for almost 100 years before being donated to the Smithsonian Institute in 1912 by an heir of Amistead, Eban Appleton, a New York stockbroker. He was concerned about the deteriorating condition of the flag and wanted it to be preserved. Also on Level 2 is a exhibit of a partially reconstructed/preserved house that stood at 16 Elm Street in Ipswich, Mass for 200 years before being donated to the Smithsonian. The exhibit is called "Within the Walls" and chronicles the lives of the many families who lived in that home over the years, and their part in history....very interesting. Next up was Level 1, the basement. On this level is found an exhibit called "Lighting a Revolution - Electricity Hall" which chronicles the history of electricity, lighting, etc. Then on to "Power Machinery", "On the Water - Stories from Maritime America", and "America on the Move".....my favorite. I could have spent 3 hours just in "America on the Move"
Frankly the 1st Level (Basement) is worth a whole day by itself....maybe more. I hadn't looked at my watch since we walked in the doors of the NMAH......just as we were entering the Martime exhibit I did, and it was 20 minutes to 4.....the time had just melted away once again. We quickly walked through the Maritime exhibit wishing we had more time, and were back at the car just before 4. It was still drizzling as we drove up the on ramp of the Interstate, but the drive home was uneventful, and the traffic was not too bad. All I can say is "WOW!" We spent the evening reading....me another Zane Grey book, which I finished around midnight. 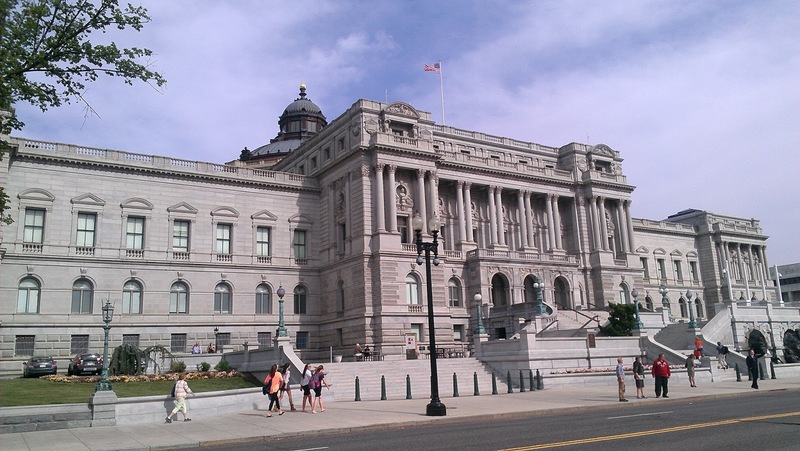 Tuesday is our last full day here in the D.C. area, and we will be heading to the Library of Congress and the Supreme Court Building, and the Portrait Museum. We had intended to head back into the National Mall to spend some more time at National Museum of American History, but after two days of site seeing in a row, and an electrical issue that popped up Saturday night/Sunday morning we decided to stay home for the day. A few months ago I wrote about installing 20 some odd feet of LED strip lighting between the curtain valance and the curtains in the living area of the coach (see my ACCENTS post from January 15th). I used a 12 volt dimmer box to control the lights, and it worked great until recently. Recently I would wake up in the middle of the night to what looked like lightning flashes (thunder and lightning) in the front of the coach. I knew it wasn't raining, and there was no thunder.....what is was was the strip lighting kind of strobing....like it would keep going off and on every 1/10th of a second. The first few times it happened I would just keep turning the lights on and off until they stayed off. Saturday night/Sunday morning that did not work anymore. I had to disconnect a wire to keep them off, because I can't let those lights keep strobing all night/day as that will drain the batteries. I originally bought 4 of those 12 volt dimmers through Amazon, and had only used the one so far, so Sunday morning I went into the trailer to find the other three and use one of them to replace the, apparently, defective one. By the time I finished with that project it was Noon time, so instead of doing any site seeing TLE went shopping....we'll be leaving for Indianapolis in a few days and need to restock the pantry and fridge.....and I decided to try and install the new "ignitor" I got for the BBQ a few weeks ago, but never installed......well, one evening I tried to install it before I BBQ'd some fish, but after 10 minutes it was obvious that I would have to do some major disassembly to get the old one out and the new one in, so I deferred the repair to another day......"another day" came Sunday. I took the BBQ apart....well mostly apart....trying to install the new one, but it is a little different than the old one, and I had to do some modification to it to make it fit. After a couple of hours I came to the conclusion that I was trying to make a square peg fit in a round hole, and put the BBQ back together. I can still light the BBQ, I just need to use a lighter to do it....a small inconvenience. I think the best thing to do is call Sea-B-Que and see if I can get one from them that will fit properly.....guess I should have done that in the first place. About 3 TLE returned from her shopping spree, and began to put the spoils away. She purchased some salmon for dinner, and her plan was that I should BBQ it.....not a problem until it started raining. We discussed a few alternatives, but finally opted to just deploy the patio awning so I could use the BBQ ....that worked out just fine. TLE made a carrot and red cabbage salad with a light mustard dressing, some white rice and squash to compliment the salmon. In a restaurant this plate would come to around $24 (conservatively) per person...throw in another $4+ for each glass of wine and 15% tip and you're at $33 per person......our cost...$7/person.....the cook did get a nice gratuity. After dinner we spent time reading (okay, I took about a 2 hour nap in the recliner, but I did read for a while), and then at 11 we turned on the TV to watch "The Amazing Race".....it's down to the final 4 teams after last night's episode, and the two hour finale will be next Sunday. As you will know if you have been following my blog for very long I am a Louis L'Amour fan. He wrote a couple hundred westerns, and I have read almost all of them. In the past few months I have begun to read other Western authors such as Max Brand, and Zane Grey. 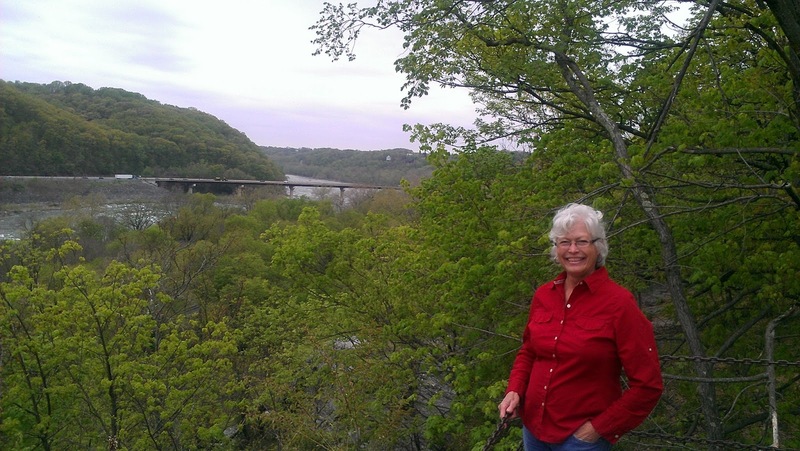 I just finished a long Zane Grey book entitled "The U.P. Trail" a 400 page novel about the building of the Union Pacific RR from Omaha to California....if you buy the hard cover copy of this book on Amazon it costs almost $26....I got it free on my Kindle. It continued raining all night....a very light, but steady rain, and it is still raining as I write this morning (9:45 am)......I cannot reiterate often enough how nice it is to wake up during the night and hear the rain on the aluminum roof. I woke up this morning around 6 and just lay in bed listening to the rain for an hour, or so......just makes me feel all warm and fuzzy inside. It is really a good thing we got the Honda back Saturday because it was in continuous use most of the day Sunday as there was heavy cloud cover....I was able to get the batteries back to 92% by the time I turned off the Honda at 7 pm. The quiet hours here in Greenbelt Park are from 10 pm to 7 am, so we used the inverter to watch TV at 11 pm. Our original intent for Saturday was to get an early start to Mt. Vernon, beat the crowds, and get home early, but then lady serendipity knocked at our proverbial door Friday afternoon when I got a call from my college friend, John Dickerson. Way back in late September we spent a few days on his property in northwest Arkansas while on our way to Campbellsville, KY to work at Amazon. He had messaged me a few weeks before saying he, Cathy and Dakota were going to be in D.C. this weekend, but at that time I thought we would be long gone.....that was before I got sick in Huntington, WV and our travels were delayed a week. Anyway, he wants too know if we want to get together for dinner Saturday, and I answer "YES! ", of course! So, instead of leaving around 8 am, we decided to leave at 11:00 to spend the afternoon at Mt. Vernon then drive 9 miles up to Alexandria to meet the Dickerson's in old town Alexandria for dinner. Around 9:30 I got a call from the small engine place over in College Park that I took my Honda 1000 watt generator to for repairs advising it was ready for pickup......perfect! 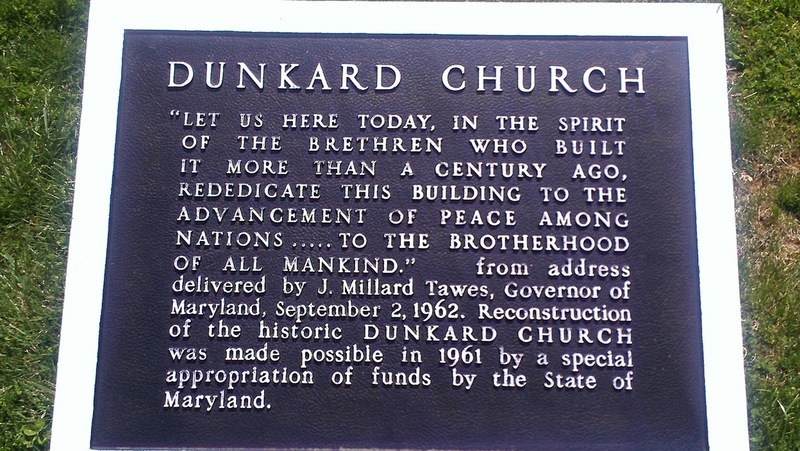 Originally they didn't think it would be ready until this Tuesday.....the day before we leave D.C. for Indianapolis. So, this works out great.....had we left at 8 am for Mt. Vernon I would have had to wait until Monday to retrieve the generator. We have been using the big 7.5 kw on board generator first thing each morning to put a little juice back into the batteries before the sun gets high enough to start charging the batteries via the solar panels. At 1/2 gallon of propane an hour it is much more expensive to operate than the Honda at 1/2 gallon per 4 hours of regular unleaded. We have had the Honda around 7 years, and in that time it has performed flawlessly without even a hickup until last Sunday. As it turns out it was a BIG hickup, and it needed a lot of TLC....about $287 worth of TLC.....the carburetor needed to be rebuilt, the spark plug replaced, oil changed, air filter replaced...etc., etc. Like I've said before.....it's only money, and the Honda is an important part of our lifestyle. Amazingly it took me close to an hour to make the 8 mile round trip drive to Precision Small Engine.....Greenbelt Road east bound was reduced from 3 lanes to 1 lane for road work that suddenly appeared overnight....there was nothing going on Friday night. It took me over 30 minutes just to get to HWY 1. Then on the way back there was a bad accident on HWY 1, which further delayed me. I was having flashbacks to rush hour traffic in Southern California! I did finally make it home around 10:40, and we were on our way to Mt. Vernon by 11:30......we headed south on the Interstate past Washington D.C. and exited to HWY 1 in Virginia around 12 only to find bumper to bumper traffic the last 6 miles to Mt. Vernon.....no construction and no accident......just really bad traffic. We finally arrived at the parking lot around 12:40. Tickets for seniors (62+) to tour the mansion, and estate are $16/person. When your ticket is issued it has a time stamped on it when you may get in line to go through the mansion. The line itself was a 100 yards long just to enter the house. Our start time was 1:20, but they were behind about 10 minutes due to the large number of people visiting Mt. Vernon on this beautiful, sunny day. While we waited our turn to get in line we toured some of the out buildings such as green house, sleeping quarters for male and female slaves, etc. Then it was our turn to get in line....it took about 20 minutes to reach the house. 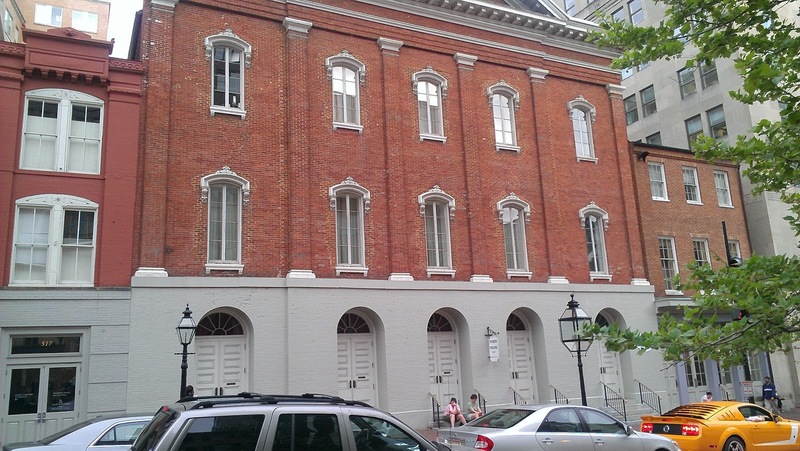 It was amazing to think that George and Martha Washington walked the corridors of this home, and the walkways around it over 250 years before. It is hard not to have goose bumps as you literally walk through "history". No photography, or videography is allowed inside the house, so no inside shots today. 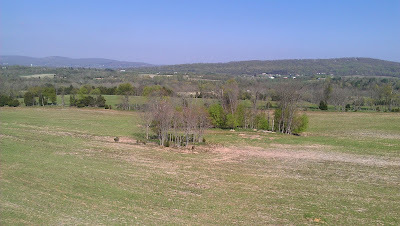 The view above was called "The Bowling Green" by Washington. He loved mowed grass, and landscaping. 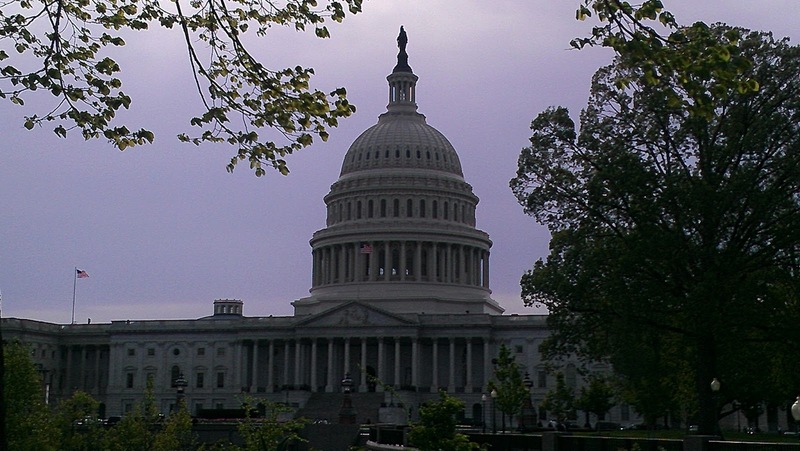 The "Necessary" is an example of Washington's pioneering idea to centralize the collection of human waste and dispose of it in a way that did not contaminate the land, or water. There were a number of these little houses scattered around the property. They had "drawers" that could be pulled out so the contents could be properly disposed of.....yep, that's the job I'd like to have had.....lol! 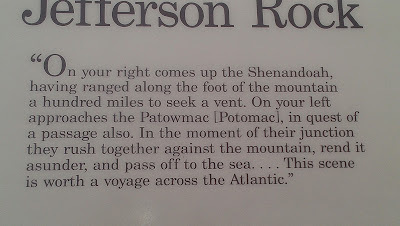 The view of the Potomac from the "back porch"
Washington loved Mt. Vernon, but the call of duty to his new country was great and he spent little time there from the late 1760's until he finished his second term as President in 1797. He left government in the picture of robust health at age 65. He and Martha spent 2 years enjoying Mt. Vernon until December 12, 1799 when he spent a number of hours out in bad weather ranging from sleet to rain, caught a cold, and died of a throat infection 2 days later. No doubt the antibiotics we take for granted today would have saved his life then. It really is not possible to relate in this small space his extensive part in the history of the birth of our nation. 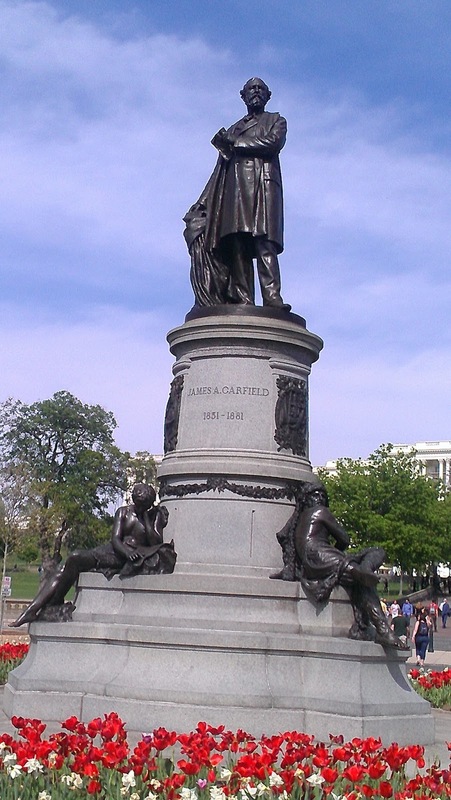 He was so well respected by people in the original 13 states that we was elected twice unanimously to the Presidency. On site there is a large museum dedicated to his history from a young lad to his death. We could have spent most of the day just in the museum. Over the years of Washington's life the estate at Mt. Vernon grew to some 8,000 acres. He owned property all over the east coast, and is said to have owned close to 53,000 acres in total....mostly farming operations......at the time of his death. 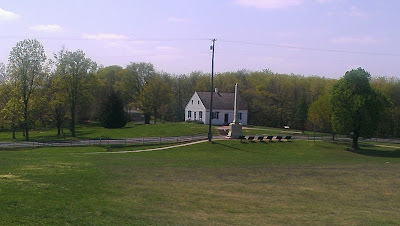 Those who have preserved his estate have reconstructed, on site, the 16 sided barn Washington designed to speed up the processing of harvested wheat. The barn was a two story affair. It was designed so that freshly harvested wheat could be laid on the latticed flooring (see below) and then horses would walk around the circle on the wheat separating the wheat berries from the stalk and chaff. The wheat berries would drop through the lattice to the solid wood floor below and then be gathered by workers. This design significantly sped up the processing of the grain, and enabled him to get his flour to market more quickly. 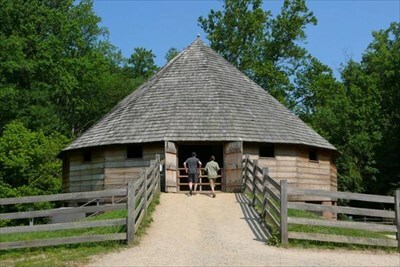 The reason for the 16 sides was to eliminate corners making it easier for the horses to walk in a continuous circle. Around 4 we had absorbed as much history as we were able and decided to head back up to Alexandria for the rest of the afternoon. Just as we got to the car John called saying we should meet at 6 pm at Murphy's Irish Pub at 713 King Street in Alexandria. We arrived in Alexandria around 4:15 and spent the next 1.5 hours walking around the old town, which is quite lovely, and down to the riverfront. In the picture above you can see the proximity of Alexandria to the Capitol.....not that many miles distant. 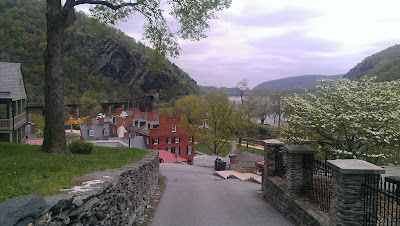 This view is looking straight north along the Potomac. We met John, Cathy and Dakota precisely at 6 at Murphy's, and enjoyed great conversation, and food. As I have said often, this journey has become more about the people we have met, and spent time with along the way than about what we see. Don't get me wrong......we are thoroughly enjoying all that we are seeing, but it is the people who are the most memorable, and extraordinary part of this journey. Thank you John, Cathy and Dakota for taking time out of your busy weekend to spend time with us! 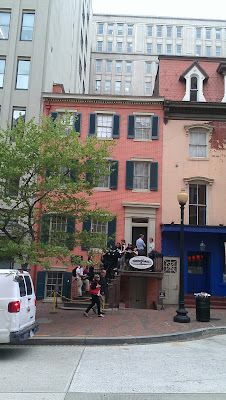 We had planned to head back to the National Museum of American History Friday, but that bowl of Jello got in the way. Actually the lack of free parking got in the way. We arrived at the National Mall just before 11 am....pretty early start for us.....and cruised by all the places where we had been able to snag a free 3 hour parking spot in the past, but everything, everywhere, was jammed. After making a couple of loops around the Mall I suggested "today" might be a good day might be a good day to go and see Arlington National Cemetery. We knew we would find parking there, even if we had to pay for it, which we did. We arrived just before 12 pm and got a parking spot on the first level of the parking structure in the shade. We headed for the ubiquitous visitor's center to get oriented. I'm not sure "oriented" is what we got.....it was jammed with school age kids......wall to wall...seriously. 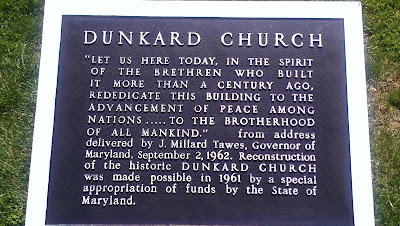 I managed to get a picture of the plaque below giving basic information on when the National Cemetery was established. 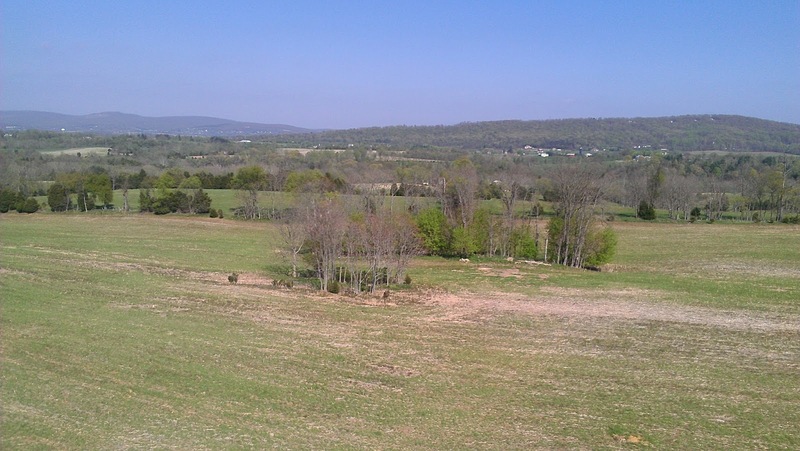 The property...a little over 600 acres, was the estate of the Custis family until the Civil War. General Robert E. Lee married one of the Custis girls, and lived in Arlington House until the beginning of the Civil War. Arlington House stands on the highest ground of the Cemetery, and you can see the Lincoln Memorial, Washington Monument and the Capitol Building from the front porch of the large home. Ironically, General George Washington also married a Custis girl many years before, so through marriage Lee was related to Washington.....I did not know that before. 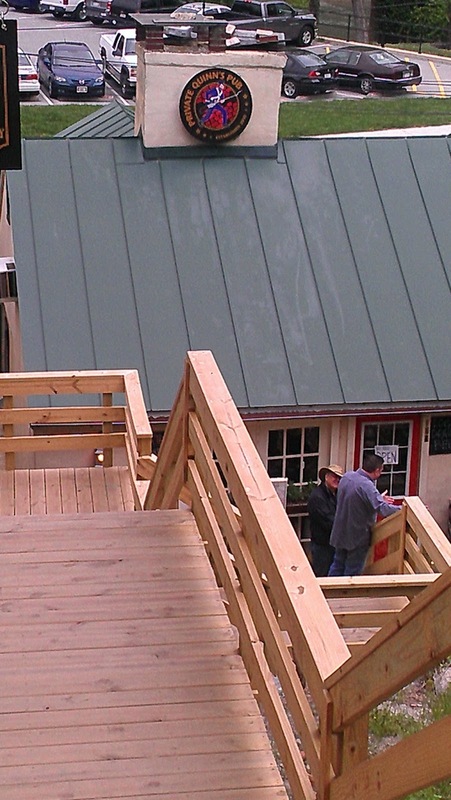 On the site of Arlington House is a small museum honoring General Lee. It was interesting to see that Lee's first assignment after graduating West Point was Fort Pulaski near Savannah, GA. You will recall we spent part of a day at Fort Pulaski in early March. 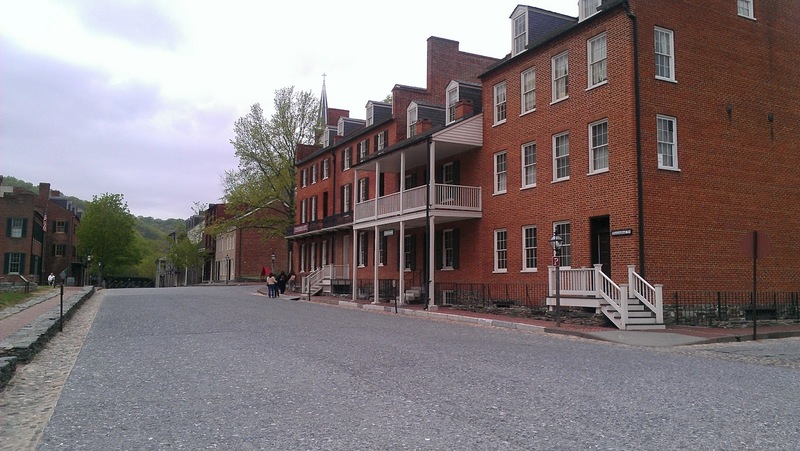 I did not realize when we were at Harpers Ferry that Lee had been sent there to command the troops after the John Brown raid on the armory. Of course a visit to Arlington would be incomplete without visiting the burial place of John F. Kennedy. You can see the "eternal flame" in the background. His wife Jackie is buried next to him. We headed over to the Tomb of the Unknown Soldier getting there in time to see the "changing of the guard", as well as the "wreath ceremony". While listening to "Taps" being played it is difficult not to get a little misty eyed. After our visit to the Tomb of the Unknown Soldier we walked around Arlington for about 45 minutes......below, as you can well imagine, is what you see everywhere. It is sobering to see how many have given the ultimate sacrifice for our country. Wherever you walk in the park people speak in hushed tones. By the time we got back to the car it was after 2 pm....we thought briefly about heading over to the American History Museum again, but the traffic was already getting heavy, so we headed home arriving around 3 pm. We had heard about a local Mexican restaurant called "Alamo" Mexican Restaurant, so we decided to head over there at 5 for dinner. Yelp gives Alamo a 3.5, but we would give it a 4. One of the nicer Mexican restaurants we have eaten at on our journey. We stopped by Jonathan's home to pick up an Amazon Prime shipment of the Howe's diesel additive I have come to like so much. I got a gallon this time.....good for four tanks of diesel....that should last me a while! Tomorrow we head to Mt. Vernon, and then to Alexandria for dinner with friends. 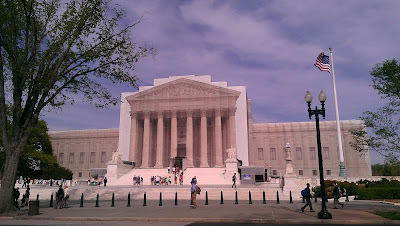 Hard to believe we have been in Washington D.C. for 8 days already, and there is still so much to see. We had, in relative terms, a warmer night Wednesday night....it only got down to 45, and I only had to run the middle gas heater to warm up the coach for a change. As you know we spent some time by the fire Wednesday night, and apparently there was a lot of pollen in the air. TLE and pollen do not mix well. TLE woke up Thursday with watery eyes, and really did not feel like spending the day along the National Mall, so we called an audible and decided to stay home and take a bike ride early afternoon after it had warmed up sufficiently. 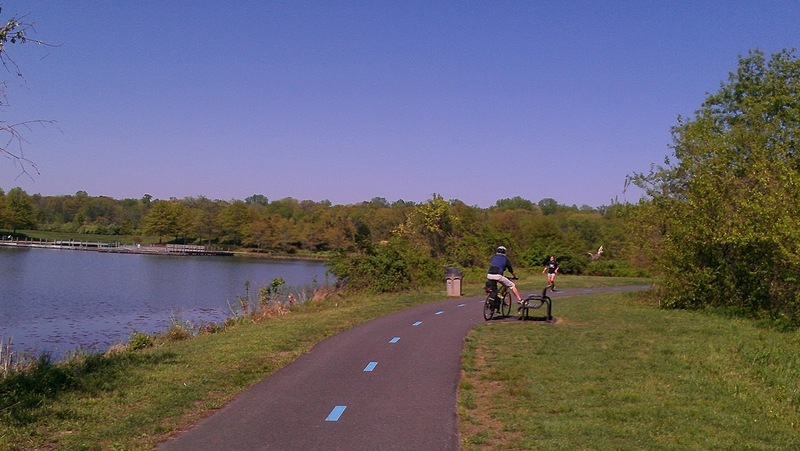 There are numerous bike paths all over the D.C. area, and it is possible to ride all the way to the National Mall using "Bike Paths". "Bike Paths" are not to be confused with "Bike Lanes". "Bike Paths" are typically separate from the roadway and often are far from the roads, whereas "Bike Lanes" share the road with cars and are only separated from traffic by painted lines. The nearest "Bike Path" to Greenbelt Park is the Paint Branch Trail which roughly follows the path of the Anacostia River. 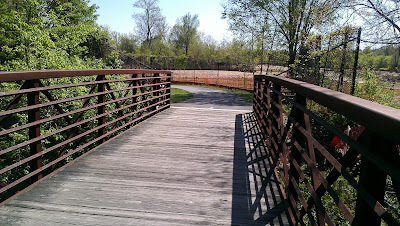 The path also runs around the edges of the University of Maryland. 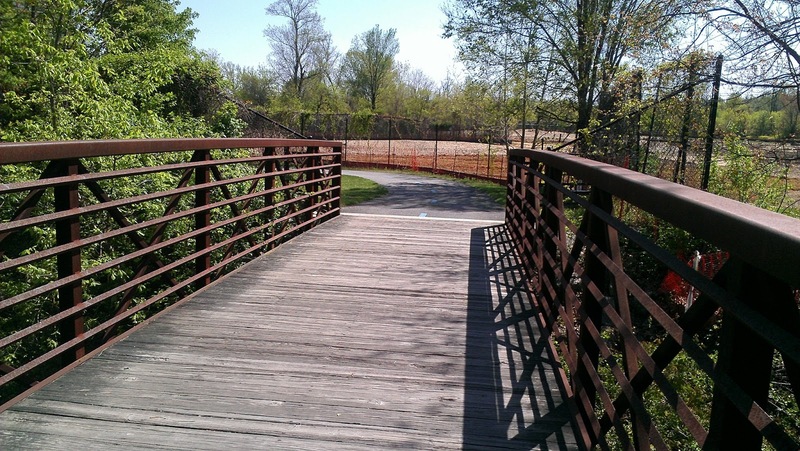 After attending to some chores around "home" we set off around 1 pm to follow the Paint Branch Trail down to Cherry Hill Road where there was a hair salon (Shear Pleasure) TLE had found on Yelp that had very good reviews. Ever since she let the lady at the Supercuts in Stuart, FL cut her hair back in February she has been unhappy with her hair. She always looked great to me, but apparently it took her a lot longer each day to attain that state of fetching beauty that I appreciate so much about her. The Anacostia River...TLE knows she is getting her hairdo fixed today! The night we met Jonathan and Shari at the dive bar (The Big Hunt) in D.C. they had told us about the tornado that touched down near the University of Maryland September 24, 2002. 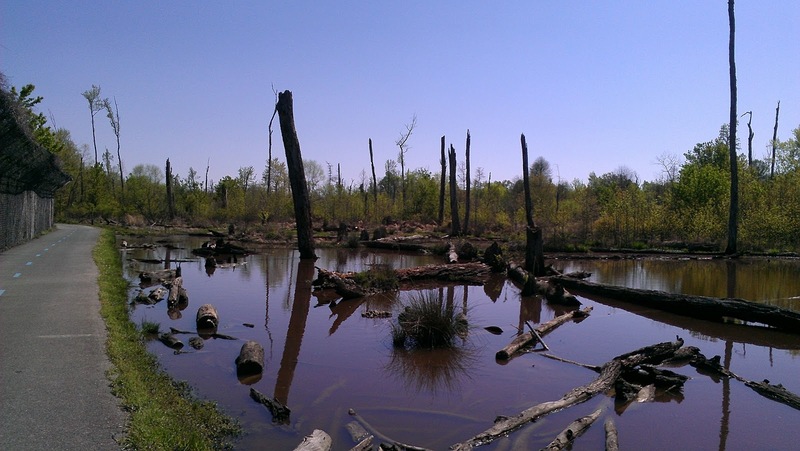 Well, the picture above is of some of the devastation to the forest land along the Anacostia River that resulted from that touch down. In all we rode around 6.5 miles north on the bike path to Cherry Hill Road, then up a hill to the shopping plaza where Shear Pleasure was located. Of course, lady serendipity shined on us as I also spied a Starbucks nearby. By this time is was after 2 and I was getting hungry so after TLE had gotten her hair done, and I might add she is very, very happy with this cut, we headed over to Starbucks for coffee (Chai Tea for TLE), and for me a Panini Southwest Chicken sandwich. I used to get this sandwich all the time at the Starbucks near my office in Rancho Cucamonga.....they are soooo good! After a brief stop at the local "Shoppers Market" for some steaks, wine, eggs, etc. we headed for home. 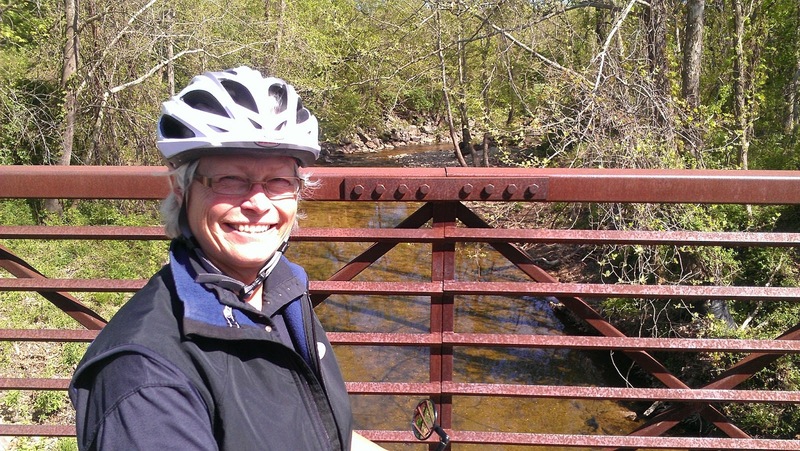 When we left the park to connect with the Paint Branch Trail we rode downhill for about .6 miles.....it didn't seem that steep until we began to ride back up it near the end of our ride....we were both quickly in "granny gear" and chugging up the hill. Just past the crest of the hill we found the entrance to Greenbelt Park and rode the last 1.5 miles back to our coach arriving a little after 4:30. 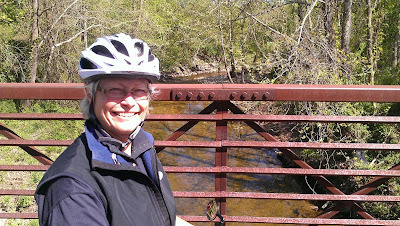 It was a great day for a bike ride, and it was so nice to change our plans at the last minute and go riding. Shortly after 5:30 I got out the BBQ and grilled the filet mignons TLE had bought....TLE made broccoli and saute'd mushrooms and onions.....what a delicious dinner. 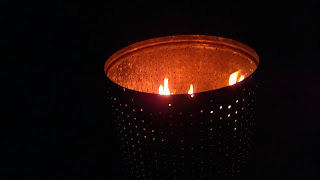 Since it was another warmish evening we put another Duraflame log in the fireplace and sat outside talking about our travel plans for the rest of the year, and into next. We have a general plan....always subject to change, of course. We will head back to the National Mall Friday early to see some more American History, and then over to Arlington National Cemetery. Wednesday dawned cold again, but the sun was out, and it warmed up quickly.....TLE was near the end of a book that she had been reading with some focus and intensity the past few days, so she wanted to finish that book before we headed off to town. The forecast was for temperatures in the mid to high 70's....a welcome change for sure. After 3 days off from touring the National Mall we headed back around Noon time on Wednesday. 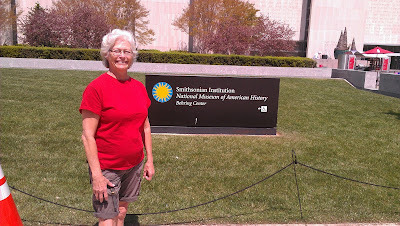 Our destination for this day was the National Museum of American History, another of the Smithsonian museums. 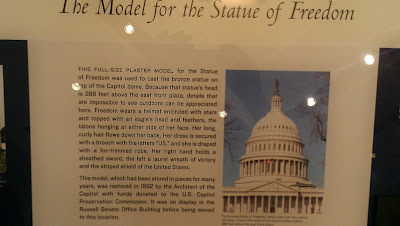 We quickly found free 3 hour parking in the tidal basin parking lot again, and set off on foot around 12:25 to this museum on the opposite side of the National Mall from the Air and Space Museum. I had no idea how big this museum is.....of course we are talking about 237 years of history, right? 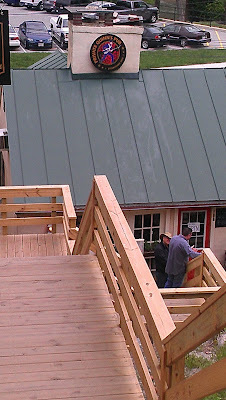 There are three floors.....2 above ground, and a basement level. We decided to start on the top level, and work our way down to the basement.....in 3 hours we saw less than 1/2 of the top level.....the top level includes a large wing dedicated to the "Presidency", and another wing dedicated to "Americans at War"....that's as far as we got before it was time to move the car.....of course, by this time it was getting close to 3:30 and I was hungry. Obviously, we will need to spend more time there Thursday, and maybe Friday. We got back to the car, got a blanket to sit on, and ate our late lunch under a tree near the car, then moved the car up to the area behind the Air and Space Museum finding another free 3 hour parking spot very quickly. Instead of heading back to the History Museum we decided to walk up to the Capitol and around to the far side where the Supreme Court, and the Library of Congress are located. 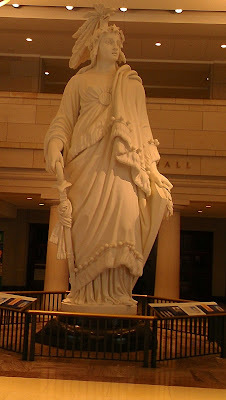 I am sure at some time in my past I knew that the statue atop the Capitol Rotunda was the "Statue of Freedom", but I had forgotten. 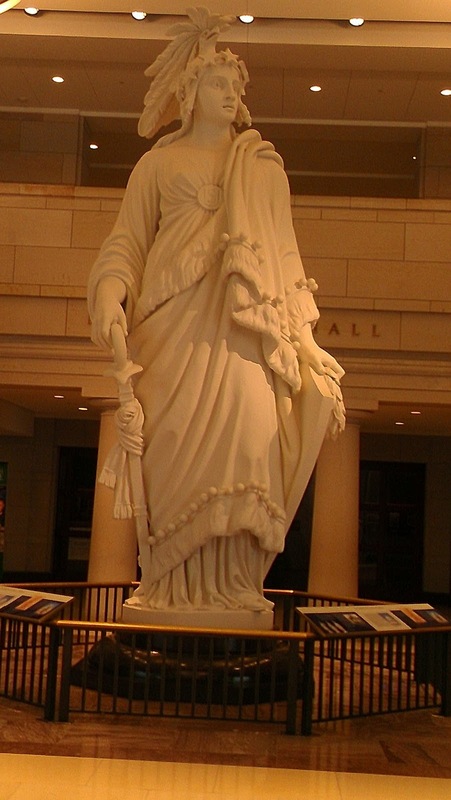 From street level it appeared to me that it might be a statue of a Native American, but that notion was quickly dispelled when we entered the Capitol Visitors Center, which, by the way is underground. We arrived there around 4:15 and only were able to spend 7, or 8 minutes inside as it was near closing time. After they politely kicked us out of the Capitol Visitors Center (we'll have to go back....there is a lot to see there, too) we headed a block, or so over to take a picture of the Supreme Court, which, like so many other structures here in D.C., is undergoing some sort of renovation, too. 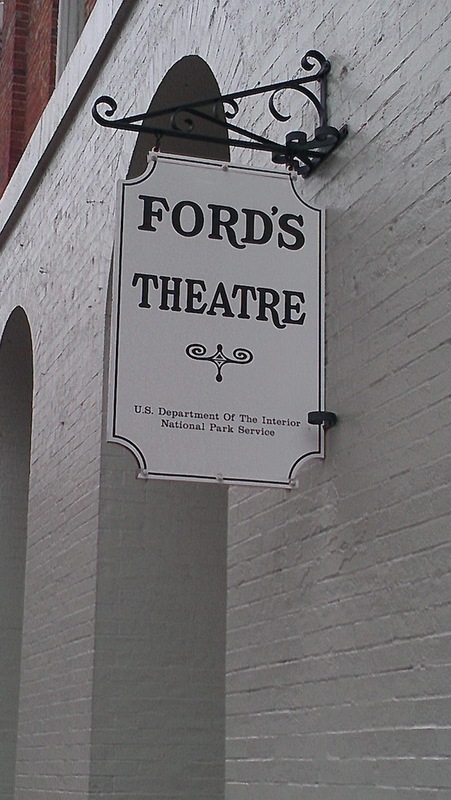 Since it was now after 4:30 we decided to do some walking and headed up to "E" Street and then over to 10th Street to see Ford's Theatre.....the site of Abraham Lincoln's assassination by John Wilkes Booth. It was a long walk, but we covered the ground quickly, arriving just around 5 pm. Below is the house where Lincoln was taken after the shooting, and where he died the next day. This whole area is a seedy tourist trap kind of place, and there were a lot of vagrants standing around with their hands out for donations. As we were walking along "E" Street toward Ford's Theatre we saw a Starbucks at the corner of "E" and 7th, and decided we would stop there on our way back to the car to get some refreshments. Of course, I ordered a Moca Frappuccino, and TLE got an Americano (ice coffee). We sat for a while at the "bar" drinking our beverages and talking about our day, then started the multi block walk back to the T-Bird, which, conveniently, was at the corner of 7th and the National Mall. We got in the car around 5:45.....right in the middle of rush hour.......again.......our timing is impeccable! The traffic around the National Mall was mind numbing, but eventually we were able to creep out of the congestion and headed for home, but not before stopping at the local Safeway to get some Duraflame logs for our outdoor fireplace......we had wanted wood, but this store had none. As near as we can tell there is no wood for sale here in the Park either, but we see fires around us every night. 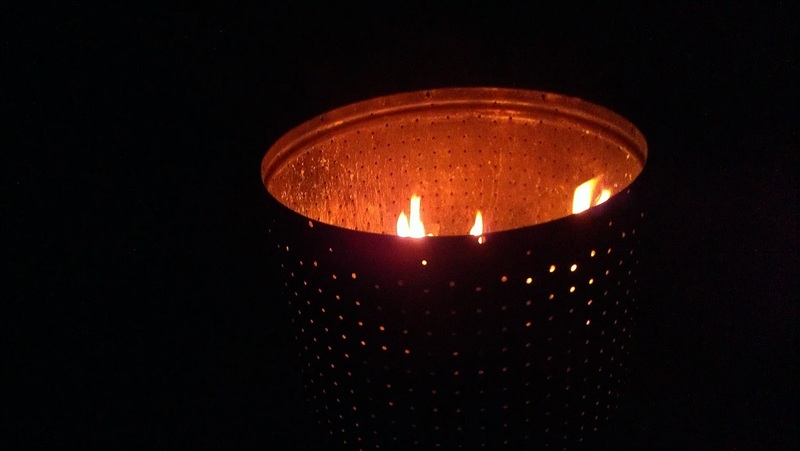 The air temp was still balmy when we arrived back in camp, so we decided we would have a fire that night for sure. After eating a delicious chicken salad prepared by The Lovely Elaine we headed outside to sit by the fire for what turned out to be just an hour.....it started sprinkling, and so we put away the chair and headed inside. It sprinkled on and off for several hours, then the wind came up. We watched NCIS, NCIS L.A., and Body of Proof (recorded Tuesday night) before heading to bed. We actually slept with the windows open most of the night, which is a first here......around 2 I awoke to wind and the sound of rain on the roof, but it still wasn't that cold! 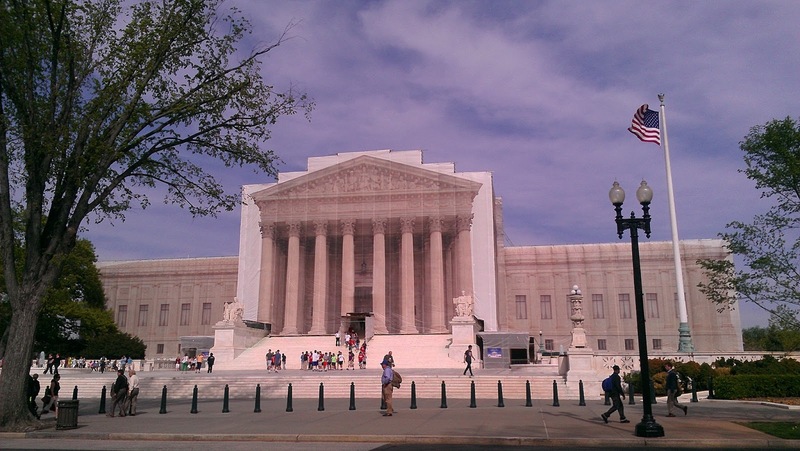 Washington D.C. - Day # 6 - Road Trip! We had big plans for Tuesday....sometimes the big plans are bigger than what is possible in one day, but we gave it the "old college try" as my father often said. We planned to drive first up to Harper's Ferry, WV some 67 miles northwest of our location. Then up to Antietam, MD and finishing at Gettysburg, PA.....well, that was one historic site too far. 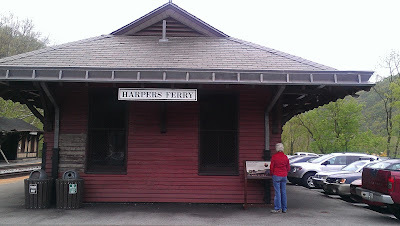 We left "home" around 9:45 for Harpers Ferry. 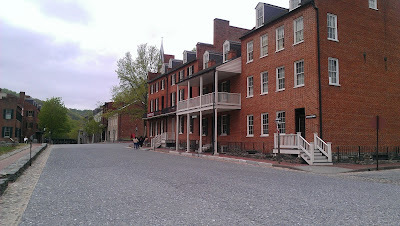 The drive was without much traffic, and we arrived around 11 at the Harpers Ferry visitors center. All of Harpers Ferry is considered a National Park, but in the off season you can drive into "town" and find parking, and we could have this day, but it seemed easier to park at the visitor's center and take the free shuttle down to Harpers Ferry proper, so that is what we did. Harpers Ferry is located at the confluence of the Shenandoah and Potomac Rivers and was the scene of several historic events. One of them involved a gentleman, John Brown, an anti-slavery activist who attacked the Federal Armory with 21 men in an attempt to gain possession of the weapons and use them to begin to free slaves in Virginia. He believed when news of the attack spread the local slave population would join he and his men, but it didn't happen. 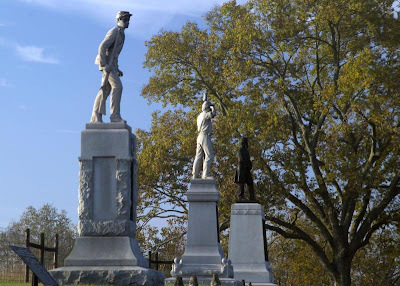 Ultimately the battle lasted 36 hours, with John Brown and his men ultimately being captured, and later hanged for murder and treason. Many believe this event led to the beginning of the Civil War. 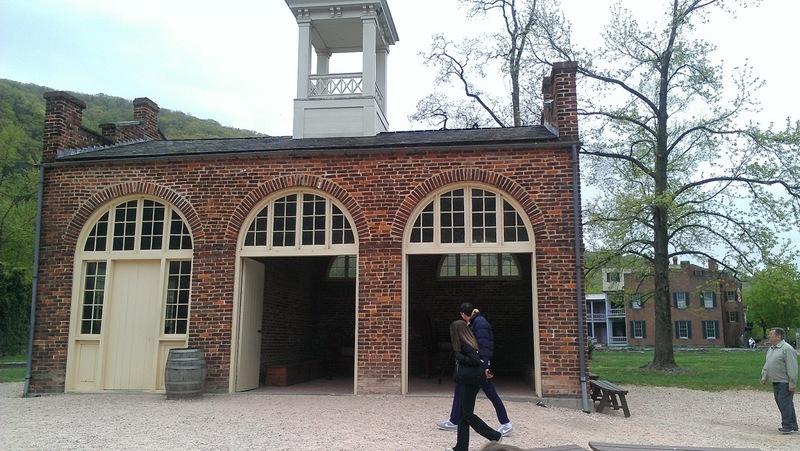 Additionally, Harpers Ferry was the site of the 2nd Federal Armory and Arsenal where the first interchangeable parts for rifles, cannon and other weapons were made using lathes, drill presses and other machinery utilizing the power of the river to turn water wheels, which in turn drove large belts of leather which powered the equipment. At their peak they produced 10,000 rifles per year. 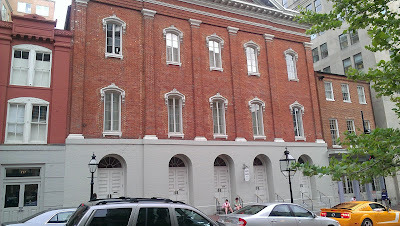 During the Civil War the Armory came under attack by the Confederacy, and the Union Soldiers burned the Armory to the ground to prevent it from coming into possession of the Confederacy. 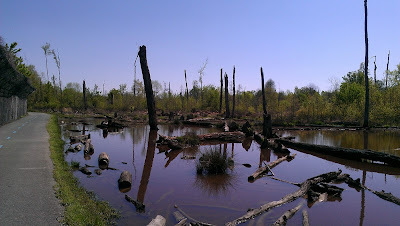 Today none of the Amory buildings remain. We spent time in the John Brown Museum reading about the raid in 1859 and the aftermath. By the time we exited the museum and walked around the town it was afternoon, and we were hungry. 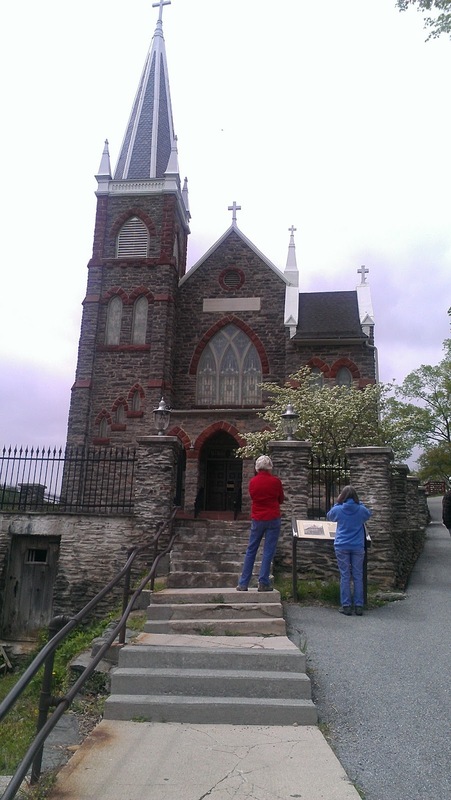 After that great lunch we continued our walking tour of Harpers Ferry. Next up was St. Peter's Roman Catholic Church first built in 1833, then rebuilt in 1896....a beautiful stone building. 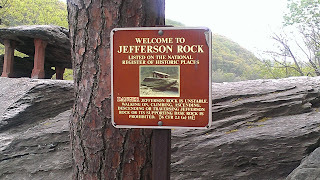 From there we continued our uphill hike to Jefferson's Rock...yes, the Thomas Jefferson. From the rock you have a view of the Shenandoah and Potomac Rivers where the come together. From Harpers Ferry we headed north to Antietam, MD the site of the single bloodiest day in the history of the U.S. On September 17th, 1862 the Union and Confederate armies came together in battle along the banks of Antietam Creek. During that one day battle lasting around 8 hours 27,000 soldiers (15,000 Union and 12,000 Confederate) were killed. That is more than died combined in the Revolutionary War, the War of 1812, and the Mexican-American war. 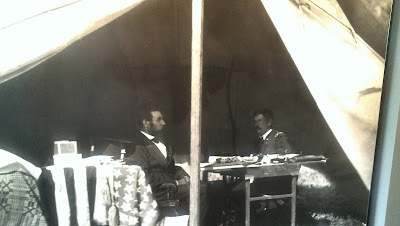 General Lee lost 25% of his total army that day, but still fought on for 2.5 years more. 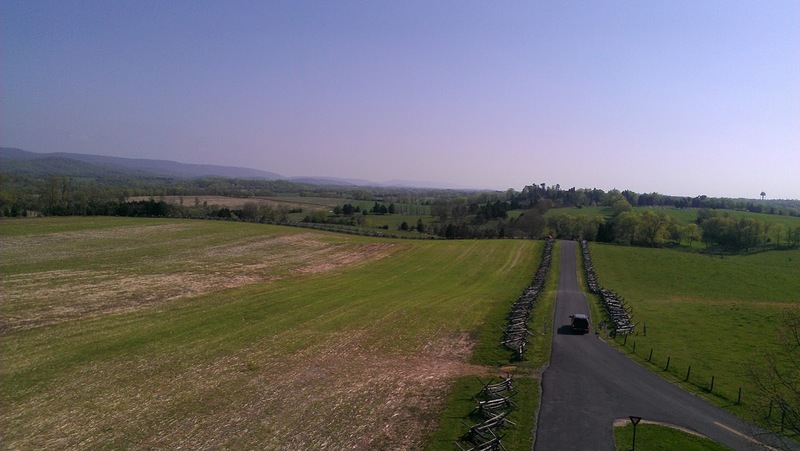 We arrived at the Antietam National Battlefield around 2 pm, and spent around 3 hours touring the museum, watching a narrated movie about the battle, and then driving and walking around the battlefield. The observation tower below was built years later. You can walk up many flights of stairs to the top and survey the entire battlefield. 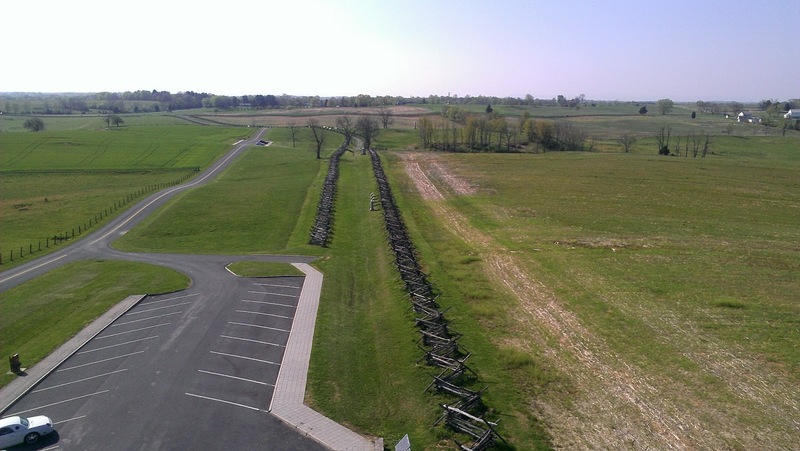 View from the tower toward Dunkard Church, where the Confederates were headquartered, and had multiple cannon batteries...this was the high ground. 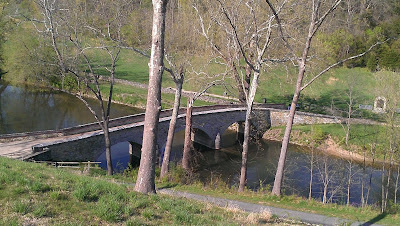 Burnside Bridge....a key crossing of the Antietam....the Confederates were able to keep the Union soldiers from crossing here long enough to allow reinforcements from Harpers Ferry to arrive. 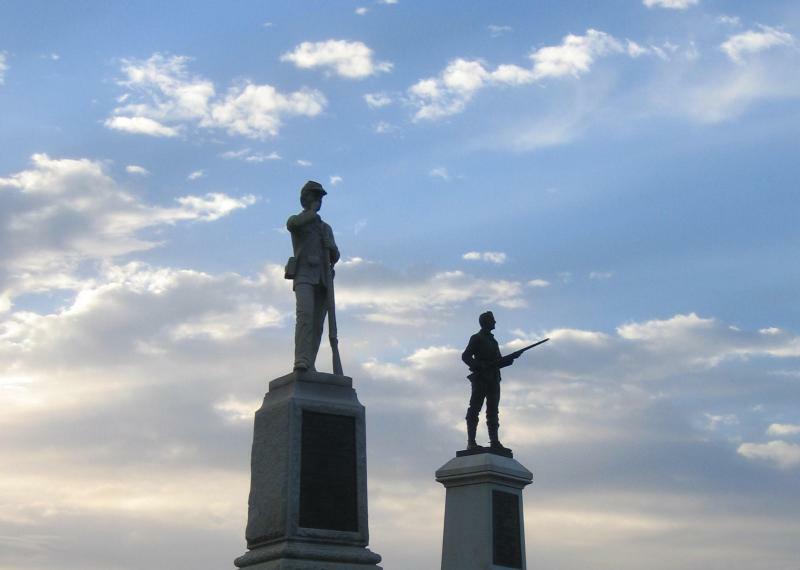 There are a lot of monuments which have been erected over the years all over this battlefield. 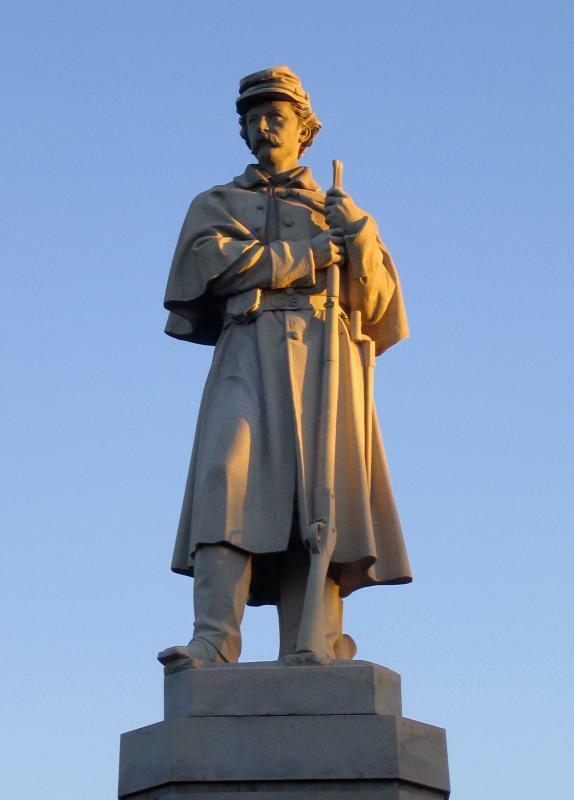 Below is the "Private Soldier" monument in the Antietam National Cemetery. Examples of the many, many monuments built to honor many of the individual regiments from various states who fought in this battle. 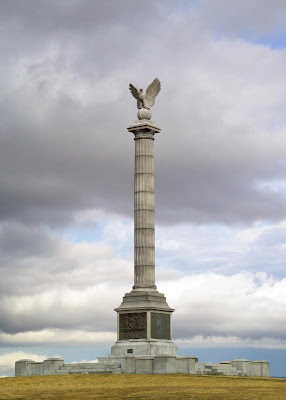 The one below was built by New York state. The 3 hours we spent at Antietam were very sobering. There were several things that struck me. It seemed the generals, colonels, captains, etc. were somewhat incompetent and sent their soldiers into slaughter without sufficient intelligence of the enemy's positions and strengths. Their willingness to engage the enemy without sufficient knowledge of what they were facing is just stunning. The amazing bravery of the soldiers who marched forward knowing they would not survive the day let alone that hour, and probably would die a horrible death, but they marched forward none the less. Many of the officers on each side attended the same military schools, and were in many cases friends prior to the war. That so many died in such a short period of time is just overwhelming. Here you see President Lincoln sitting with General McClellan trying to convince him to pursue General Lee and his ragged, decimated army and end the war, but he didn't. Ultimately Lincoln fired him. 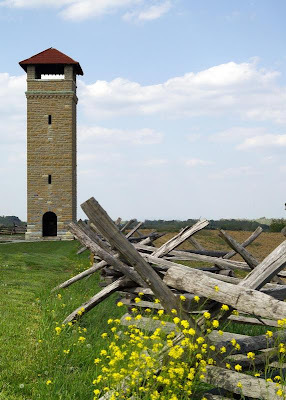 The battlefield has not changed too much over the years, and the National Park Service has done a lot to preserve it in the same state it was on September 17, 1982. We began the 80+ mile drive home around 5 and got home around 6:30. We obviously did not make it to Gettysburg....we just ran out of time, but we do plan to see it on our way back west in early May when we pass back through Hagerstown. Wednesday we return to the National Mall and more site seeing....many museums to see. Eventually we will drive over to Arlington Cemetery, and to Mt. Vernon and Monticello, the respective homes of George Washington and Thomas Jefferson. "Sunny, one so true, I love you...."